A Post & Beam Barn can be described as a barn that's built using heavy wooden timbers, joint together with ether carved wood joinery (such as pegged mortise & tenon) or metal heavy duty plates & hardware, forming an exposed structural frame. In most Post & Beam Barns, the whole frame, including posts, girts, headers, loft joists and even rafters are build with different sizes of heavy wooden beams. This gives the barn a very distinctive and appealing look. This kind of construction is far more expensive than a regular pole barn, but does provide a very solid barn frame and a feel of a well & a heavy built structure. 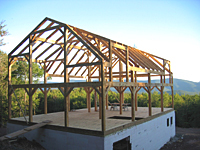 The timbers used in a Post & Beam barn are generally larger compared to a conventional barn construction. The family of Post & Beam Barns includes well known names such as Timber Frame Barns and Mortise & Tenon Barns. It's important to understand that Timber-Frame Barns and Mortise & Tenon Barns are both built with heavy timbers throughout construction, and either of them may be called the Post & Beam Barn. It's the difference in the way the beams are connected is what separates a Timber Frame Barn from a Mortise & Tennon Barn. Even though different builders might use different type of timber connection techniques, it's generally known that in a Timber Frame Barn, the beams may be either connected with heavy duty metal brackets or with mortise & tenon joinery. In a Mortise & Tenon Barn however (as the name implies), the beams are always connected using mortise & tenon joinery technique (see image) where posts and beams are both notched out to create a "male" & "female" connectors and then held together with wooden pegs. In Mortise & Tenon joinery connection, the "male" projecting end is called tenon and a "female" opened slot is called Mortise. The mortise & tenon joint provides a very strong connection and has been used for thousands of years all around the world. As shown here, "StrongTie" metal plate brackets are used to connect beams in one of the Post & Beam Barns. Some builders may use a combination of mortise & tenon and metal plate connectors on the same barn. In such case, you may call this barn whatever you like. The proper name though, in our opinion, would be a Post & Beam Barn, which basically describes that the particular barn is built with heavy wooden timbers, but does not tell you how these timbers are connected together. Other builders might build only barn walls with heavy timbers and the rest of the barn with lighter material. They may build the roof with either regular trusses or 2x8/2x10 rafters and the loft might be built with 2x10 floor joists. This is all just fine, but we can not call this type of barn a True Post & Beam barn, no matter what the builder might call it. 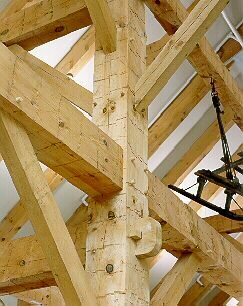 Here is a sample of a Timber Frame Barn showing a mortise and tonon joinery being used throughout construction. This image was provided by Vermont Timber Works company. Please visit their website to see more images & information about Timber Frame Barns.